David Benson Brouwer-Ancher, Sr., born October 23rd, 1950, passed peacefully on May 3rd, 2018 in hospice care, surrounded by the love and light of his immediate family members. David is survived by loving family members Rita, Alexis, David Jr., Faith, Hope, and Edward of Glenside, Pennsylvania and nephew Edward Pascoe of Miami Beach, Florida. He was pre-deceased by his mother Elizabeth Mary, nee, Brindle, father Edward David, brother Charles, and sister Mary. David, a native Philadelphian, graduated from La Salle College High School in 1968, where he played middle linebacker for the football team and center field for the baseball team. He then continued his education at Philadelphia College of Textiles and Science in Business Administration. After college, David rapidly climbed the ranks with many top retailers. He spent the majority of his career as an executive for such companies from 1975-2008, eventually rising to the level of Vice President, serving many large cities across the country. Despite his many successes in the business world, David’s pride and joy rested with his five children. Never was he happier than when he cheered them on from the sidelines of the softball or baseball fields or when he sat with them at the dinner table, sharing stories and laughs. His truest source of happiness came from watching his five beautiful children grow up. Family and friends are invited to attend a visitation on Friday, May 11th, from 11:30am-1:00pm at Craft Funeral Home of Erdenheim, 814 Bethlehem Pike. Following the visitation, there will be a memorial mass at 2:00pm at St. Luke the Evangelist RC Church, 2316 Fairhill Avenue, Glenside. The interment will be private at the convenience of the family. 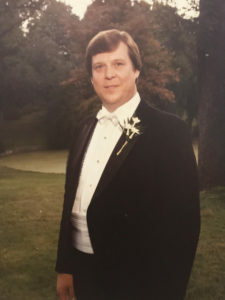 In lieu of flowers, donations may be made in David Brouwer-Ancher’s memory to Abington Hospice at Warminster, 225 Newtown Road, Warminster, PA 18974. My sympathy to all for your loss, David.